Server machine must have RAM >= 1Gb, free HDD space 2Gb, OS – MS Windows XP or higher, Linux Debian 7.0 or higher, Fedore 19 or higher, AltLinux 7.0 or higher, Sun Solaris 10. WFE Server is started on one server. Bot stations can be started on several servers. Browser with system web-interface and task notifier are started on clients computers. 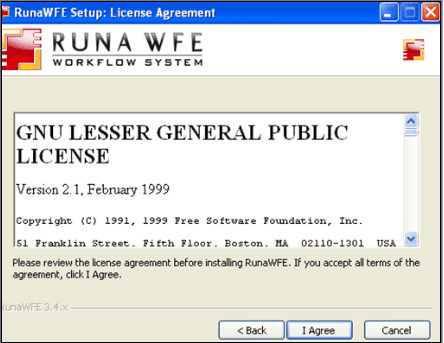 (A browser with RunaWFE web-interface is opened in task notifier window). Developer Studio and process simulator can be run on the client computers. WFE Server contains deployed business process definitions and started business processes instances. Bot stations contain bots, that check out WFE Server periodically. If started business process instances have tasks for bots, bots perform the tasks and return results to the WFE Server process instances. test developed business processes on the simulated configuration on the analyst client computer without(before) deploying new processes to the enterprise system. Note. WFE Server contains a local bot station. That's why it is possible to install bot station as a separate component only on the computer where the WFE Server is not installed. Note. WFE Server and simulator must not be installed on one and the same computer. Insert disk into drive (in case you have it on disk) or run RunaWFE-Installer.exe (if you have it as exe-file). The LGPL license notice will appear. After confirming it you'll have to choose what components you are going to install - client side or server side. Then you'll have to specify the particular components from the list. 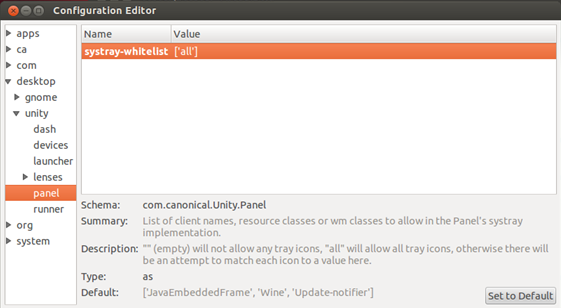 For the first glimpse of the system it is recommended to install the client side components. Simulator client side component is an adapted for a workstation version of the WFE Server and contains a local bot station. 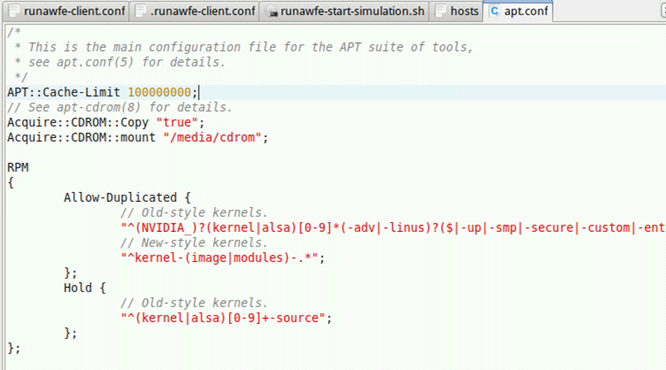 That's why the client side components are sufficient to get to know all RunaWFE features. After client side components installation, you can start it via system menu (Start / Programs / RunaWFE) or icons on the desktop. In order to start and execute business process you should start WFE Server (simulator). It can be done for example via menu command Start / Programs / RunaWFE / Start Simulation. 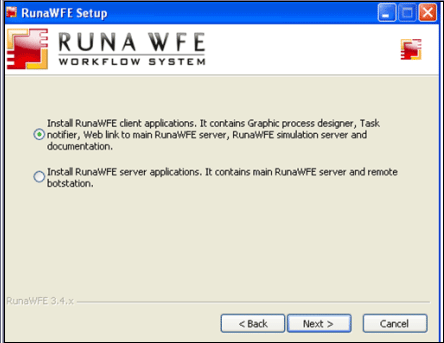 Then run program web interface Start / Programs / RunaWFE / Simulation Web Interface. Default administrator login is "Administrator" (case sensitive) and password is "wf". The main component is the WFE Server (in client side installation version - it is Simulator). All other components are optional. When the WFE Server (Simulator) is installed web browser is sufficient to work with the system. Linux OS distributives consist of rpm or deb packages. Download packages for your OS from http://sourceforge.net/projects/runawfe/files (packages are in Distributives/Distributives for Linux). At first make sure that software sources for dependences search and installation are correctly set. Use "Software Sources" or turn on necessary repositories in /etc/apt/sources.list file. Packages dependencies will be downloaded and installed automatically. Note. Superuser permissions are necessary to install WFE Server that's why "sudo" command usage is obligatory. RunaWFE can be installed from Sisyphus repository. You must consider that the version of runawfe in repository may be not the latest one. Download runawfe-x.x.x-bin.zip (from “Files” page on RunaWFE project). 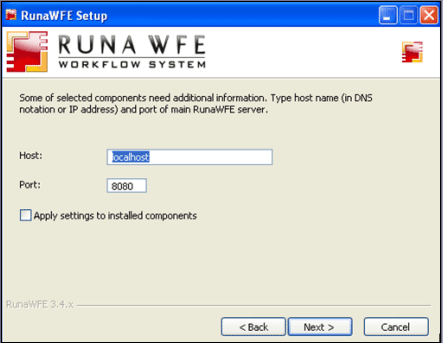 Unpack runa-wfe-*.zip archive to any folder on the server, folder name must not contain spaces. This folder will be here forth named $DIST_ROOT. 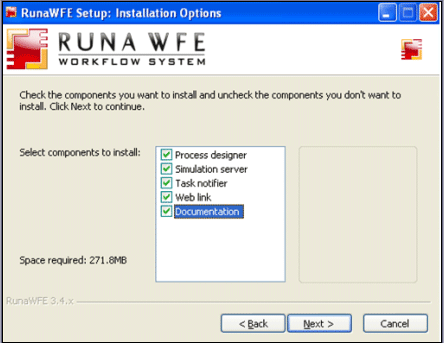 For WFE Server installation detailed description see WFE Server Developer Guide. For Developer Studio installation detailed description see Developer Studio Developer Guide. For Task Notifier installation detailed description see Task Notifier Developer Guide. Currently there are no distributive for Mac. Download archive from https://sourceforge.net/projects/runawfe/files/SRC%20and%20BIN%20files/4.0.6/RunaWFE%20Server/ and extract the contents. Go to bin directory in terminal session. Start Server with ./run.sh command. To shut down the WFE Server press Ctrl+C in the terminal session. Download archive according to your java (32 or 64 bit) from https://sourceforge.net/projects/runawfe/files/SRC%20and%20BIN%20files/4.0.6/RunaWFE%20Developer%20Studio/ and unpack it. Note. By default JBoss 4 is available only on local interface (because of security reasons). When you install Windows OS version of system with the help of installer, you have JBoss already configured for network connections. To make JBoss available on all set interfaces run run.bat (.sh) with "-b 0.0.0.0" parameter. Or you can place this parameter into run.bat(.sh) script. Simulator can be run on the client computer via system menu Start / Programs / RunaWFE / Start simulation or via desktop icon "Start simulation". If you've installed WFE Server or remote bot station, then jboss is installed as service and it will be started automatically every time the system is started. Note. To start the WFE Server superuser permissions are required that's why it's obligatory to use sudo command. Note. To start the WFE Server with the possibility to close terminal use "screen" package. To disconnect window from terminal use CTRL+A then D.
Note. By default H2 (Jboss7) is used in the system, DB is recreated with the Server restart. The simulator on the client computer can be stopped via system menu Start / Programs / RunaWFE / Stop simulation or via desktop icon "Stop simulation". If you've installed the WFE Server or remote bot station, you should stop jboss service to stop the system. If the console is available you can use Ctrl+C to stop the Server. Open web browser with http://wfserver:8080/wfe url. The page with user login and password fields must appear in web browser. Note. Demo processes files can be found in $DIST_ROOT/samples.